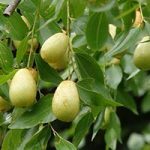 Also known as jujube, these make small trees or large shrubs and need a hot sunny sheltered position in the UK. They bear edible fruits between cherry and plum size which are eaten fresh or dried to store. We have two grafted varieties available.